Greens Plus offers a tasty variety of gluten free bars that provide nutrition, protein, energy, fiber and antioxidants for consumers of all ages and activity levels. Whether you look to grab a bite really fast while on the run, or you are in need of a quick and easy energy boost after a good workout, Greens Plus has the right solution for you - nutritious, delicious and convenient bars that meet your specific need and personal preference. 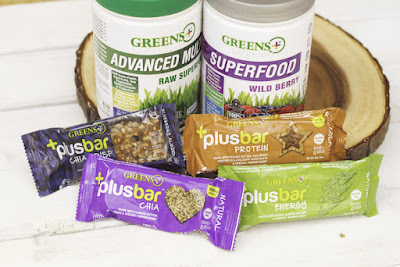 Greens Plus kindly sent me a sampler of their best gluten free bars for review, including Blueberry Almond Chia Crisp Bars, Whey Krisp Protein Bars, Chocolate Protein Bars and Chocolate Energy Bars. 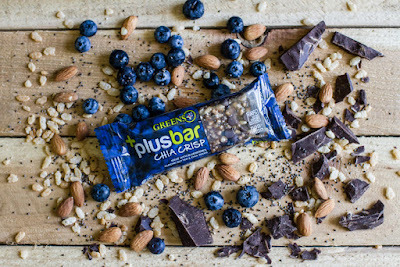 Besides being gluten-free, all PlusBars are Non-GMO, vegan, made with organic or natural ingredients of the highest quality, and with no additives or colorants. Each protein bar contains 15 grams of protein, about one third of the recommended daily protein intake for an average woman! The crisp bars are crunchy and flavorful, while the energy bars give your body a fast recharge with nutrient-rich wholesome foods, and the proprietary energy blend of Greens Plus. After sampling all four flavors, my kids and I decided that our favorite has to be the Blueberry Almond Chia Crisp Bar. Made with organic blueberries, organic almond butter, organic chia seeds, and coated with 56% organic dark chocolate, each Blueberry Almond Chia Crisp Bar contains 400mg of omega 3 and 4g of fiber. It has the perfect blend of chocolaty, fruity, and nutty flavors! The kids have been asking for more of it since all the samples were consumed. My husband loves the Whey Krisp Protein Bars better for their unique taste and texture. If you are a big fan of chocolate and peanut butter, you will sure love the Chocolate Protein Bars. The Chocolate Energy Bar is the #1 selling Greens Plus bar, with 72% organic dark chocolate. The latter three varieties all feature the Greens Plus Advanced Multi formula including AlgaeCal, Organic B Complex & Vitamin D3. Greens Plus products are formulated to provide targeted nutrition for the total body organs and cells. When consumed, they deliver quick satiety results by feeding the body on the cellular levels and delivering the energy we need on a daily basis. They are healthy snacks you can add to your breakfast, take on the go to fill you up between meals, and feel good about sharing with your loved ones. They are available at Whole Foods, Trader Joe’s, Vitamin Shoppe, Safeway and Publix. Find a store near you to try out and discover your favorite Greens Plus gluten free bar!